Many moons ago in a land far far away i resided in not only the same state as my mother but the same city, and under the same roof for a time. Now that seems like light years ago but leave it to mommie dearest to never let you get too far away. My mom Dorothy came to visit Austin last month, this wasn’t her first visit but every time she comes she acts like it is, she’s so excited and happy to be somewhere new that it reassures my soul that not everyone is lame. 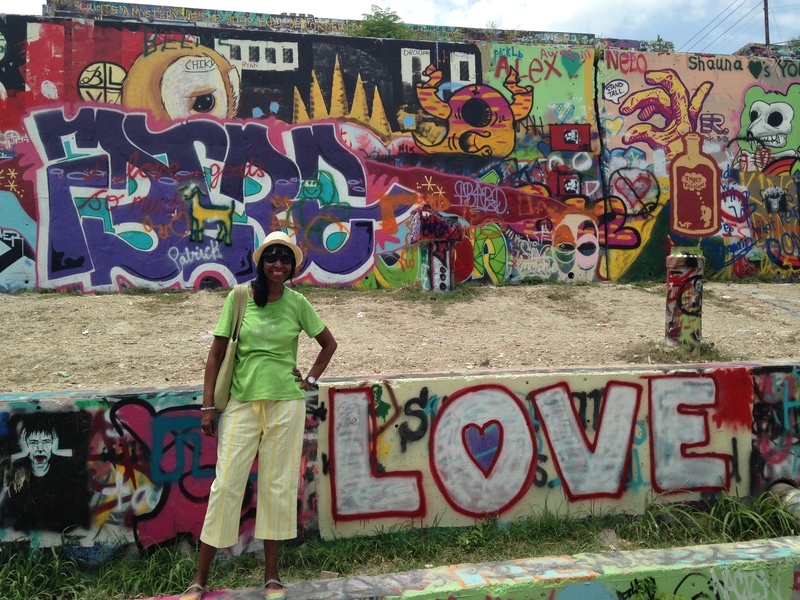 The first place we went to visit was one of my favorite places in Austin, the Hope Outdoor Gallery, or as its sometimes known as Castle Hill or Baylor Street Art Wall. I try to come here at least once a month if not more, i obviously love graffiti so this is like a little piece of heaven for me. To my surprise she actually seemed to like it! After that we were starving so we went to the Lockhart,TX otherwise known as “The BBQ Capital of Texas”. Lockhart is such an adorable small town about 30 mins from Austin. There’s 4 famous BBQ joints in Lockhart to choose from, my coworkers suggested Blacks. One of my moms favorite places to go when she visits is by far Barton Springs, not only is it beautiful its really relaxing and its so freaking hot here that you have no choice but to love the water. We ended the night and her visit at The White Horse on the east side in my neck of the woods where my friend Claudia taught her how to two-step, it was adorbs, i still cant do it! This visit was especially unique because i feel like for the first time i showed her my Austin, the first 2 visits we did the Soco things and 6th street, we saw a movie at Alamo, ate from food trucks, now i like doing those things but i don’t find myself doing those things all the time. I wanted to show her my real life here. Although i was frustrated because that’s what she does to me i appreciate her coming here so much. I know that parents encouraging and loving their kids unconditionally seems so normal but its not, i am beyond words fortunate to have a mom that loves me and doesn’t push me to do or be any other way than myself, she is always supportive and so excited for any crazy thing I’m doing or any new place I’m going. We’ve def had our ups and downs, but i know that she really loves me because she is there for me, even though she isn’t here.